Donald Gene Chandler (September 5, 1934 – August 11, 2011) was an American college and professional football player who was a punter and placekicker in the National Football League (NFL) for twelve seasons in the 1950s and 1960s. Chandler played college football for the University of Florida, and thereafter, he played professionally for the New York Giants and the Green Bay Packers of the NFL. Chandler was born in Council Bluffs, Iowa. He attended Will Rogers High School in Tulsa, Oklahoma, and he played for the Will Rogers Ropers high school football team. After graduating from high school, Chandler first attended Bacone College in Muskogee, Oklahoma, and then transferred to the University of Florida in Gainesville, Florida, where he played halfback, punter and placekicker for coach Bob Woodruff's Florida Gators football team in 1954 and 1955. As a senior in 1955, Chandler led all major college punters with an average kick of 44.3 yards, narrowly beating out Earl Morrall of the Michigan State Spartans. Memorably, Chandler also kicked a 76-yard punt against the Georgia Tech Yellow Jackets in 1955, which remains tied for the second longest punt in Gators history. Woodruff ranked him and Bobby Joe Green as the Gators' best kickers of the 1950s. Chandler graduated from Florida with a bachelor's degree in 1956, and was later inducted into the University of Florida Athletic Hall of Fame as a "Gator Great." After college, he was selected in the fifth round (fifty-seventh pick overall) of the 1956 NFL Draft, and played with the New York Giants and Green Bay Packers. He played in the first two overtime games ever in the NFL, in 1958 with the Giants against the Baltimore Colts and again in 1965 when he kicked the winning field goal for the Packers against the same Colts in a Western Conference playoff game at Green Bay. Chandler's fourth-quarter field goal that tied the game at 10–10 stirred controversy, as many Baltimore players and fans thought he missed the kick to the right. Chandler was named the punter on the NFL 1960s All-Decade Team. He went to the Pro Bowl after the 1967 season. He led the NFL in average yards per punt with 44.6 yards in 1957 and led the league with a field goal percentage of 67.9 percent on nineteen of twenty-eight attempts in 1962. Chandler still holds the record for most field goals scored in a Super Bowl with four in the 1968 Super Bowl against the Oakland Raiders, clinching the championship for the Packers. Chandler helped Vince Lombardi's Green Bay Packers teams win Super Bowls I and II. Memorably, he kicked a ninety-yard punt against the San Francisco 49ers in 1965. He was named to the All Pro team in 1967. In his twelve-season NFL career, Chandler played in 154 regular season games, kicked 660 punts for a total of 28,678 yards, 248 extra points on 258 attempts, and ninety-four field goals on 161 attempts. He also rushed for 146 yards on thirteen carries, and completed a perfect three passes on three attempts for a total of sixty-seven yards. Chandler was inducted into the Packer Hall of Fame in 1975, along with tight end Ron Kramer, defensive end Willie Davis, guards Jerry Kramer and Fuzzy Thurston and Vince Lombardi. He was selected as the premier punter for the decade in the 1960s. In 2002, he was named to the Oklahoma Team of the Century by The Oklahoman and in 2003 to the list of Oklahoma's Greatest Athletes by the Tulsa World. Chandler is also a member of the Oklahoma Sports Hall of Fame and the New York Giants Wall of Fame. Chandler died at his home in Tulsa, Oklahoma on August 11, 2011; he was 76 years old. 1 2 3 4 Pro-Football-Reference.com, Players, Don Chandler. Retrieved August 11, 2011. ↑ databaseFootball.com, Players, Don Chandler. Retrieved August 11, 2011. 1 2 2011 Florida Gators Football Media Guide, University Athletic Association, Gainesville, Florida, pp. 152–153, 159, 180 (2011). Retrieved August 28, 2011. ↑ Associated Press, "Florida's Don Chandler Edges Spartan For Punting Title", Ocala Star-Banner, p. 7 (December 13, 1955). Retrieved August 11, 2011. ↑ Pro Football Hall of Fame, Draft History, 1956 National Football League Draft. Retrieved August 11, 2011. ↑ National Football League, Historical Players, Don Chandler. Retrieved August 11, 2011. 1 2 3 4 5 Richard Goldstein, "Don Chandler, Standout Kicker in N.F.L., Dies at 76", The New York Times (August 11, 2011). Retrieved July 8, 2014. ↑ Packers.com, Lambeau Field, Green Bay Packers Hall of Fame. Retrieved July 8, 2014. ↑ Jim Thorpe Association, Oklahoma Sports Hall of Fame, Don Chandler. Retrieved August 11, 2011. ↑ Rhett Morgan, "Former NFL kicker Don Chandler dies", Tulsa World (August 11, 2011). Retrieved August 11, 2011. 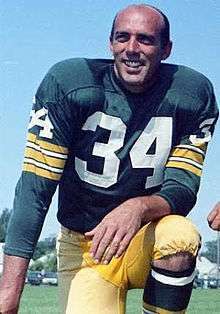 ↑ Jeff Ash, "Former Green Bay Packers K Don Chandler dies at 76", Green Bay Press-Gazette (August 11, 2011). Retrieved August 11, 2011.